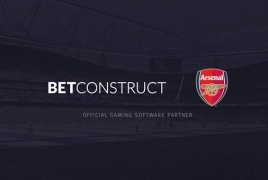 PanARMENIAN.Net - English football club Arsenal announced a new partnership with BetConstruct, an Armenian company, which is joining as the team's official gaming software partner, the Gunners' said on their official website. BetConstruct, an award-winning developer and provider of gaming technology, was founded in 2011 and has development, sales and service centres around the world. The company provides an extensive range of products, software and technical solutions for the ever-growing gaming industry. Through the partnership, BetConstruct will look to grow brand awareness of their award-winning services. “We are delighted to welcome BetConstruct into our family of official partners," said Peter Silverstone, commercial director at Arsenal. "BetConstruct has grown dramatically since its formation eight years ago and has built an excellent reputation as an innovative leader within the gaming software industry."